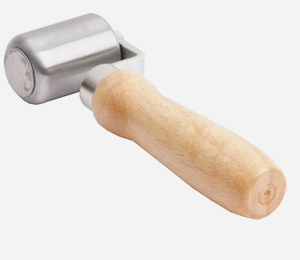 V-shaped aluminium seam roller with wooden handle for detail work. Tapered steel seam roller with wooden handle. Thin steel seam roller for intricate detail work, with wooden handle. 80mm wide heavy duty steel seam roller with wooden handle. 45mm wide heavy duty steel seam roller with wooden handle.